Archie Bradley should have been in the majors, with Arizona, his agent Jay Franklin told FOX Sports in April 2014. The reason Bradley wasn't in the bigs, Franklin suggested because of a simple calculation that benefited Arizona by delaying Bradley's debut until that May. "I think it is very apparent what is going on in Arizona," Franklin told FOX Sports' Ken Rosenthal. "Archie Bradley has proven to the Diamondbacks' organization that he deserved that opportunity by keeping his mouth shut and letting his numbers speak for his chance to pitch in the major leagues." Before he was an agent, Franklin was once in the minors himself. The player Franklin, though, never made it close to the majors, topping out at high-A. His playing career over, Franklin has gone on to a long career as an agent, representing such players as Bradley and Ian Kinsler. Franklin's playing days began in 1989, taken by the Rangers in the 8th round of the draft out of Oral Roberts University. 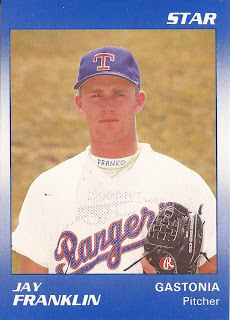 Franklin started with the rookie Butte Copper Kings in the Pioneer League. In 21 outings, one start, Franklin saved two games, but had an ERA of 9.90. He moved to single-A Gastonia for 1990. In 28 outings, 12 starts, his ERA came back down to 3.10. He missed all of 1991, returning to Gastonia for 1992. For 1993, Franklin moved to the Cubs system. He got 39 outings that year, including a June outing where he went three innings, giving up just two hits. In July, he went six innings in a start, giving up just one run. Franklin got into just five games the next year, ending his career in the minors. From there, Franklin played in Mexico and in Taiwan. He's last recorded as playing in 1998. Franklin, the brother of former major league pitcher Ryan Franklin, stayed in baseball, soon becoming an agent. In June 2013, Franklin closed the deal - with a $4.8 million signing bonus - for Rockies first-round pick Jonathan Gray. "This is a tough guy," Franklin told The Denver Post of Gray. "He's driven." That November, Franklin and Kinsler were caught off guard by a Kinsler trade to Detroit, according to ESPN.com. But Franklin told the site that Kinsler was looking forward to being with his new team. "Ian is excited about Detroit," Franklin told ESPN. "He wants to win, and he works hard. I think Detroit fans, much like the Texas fans, will appreciate that he gives you everything he's got every day. He leaves it all out on the field."